TACT’s new Document Management can help you get organized. It allows you to keep all the information that you currently keep in a physical job folder, in a central place accessible to all who need it at the touch of a button. Document Management consists of several parts. You can create documents such as Transmittals, Lien Waivers, Change Orders, RFI’s, RFP’s letters and fax covers directly through TACT and WordLink. The job, customer and vendor information is automatically filled into the document as needed. The documents are then cataloged and stored for future reporting and retrieval. 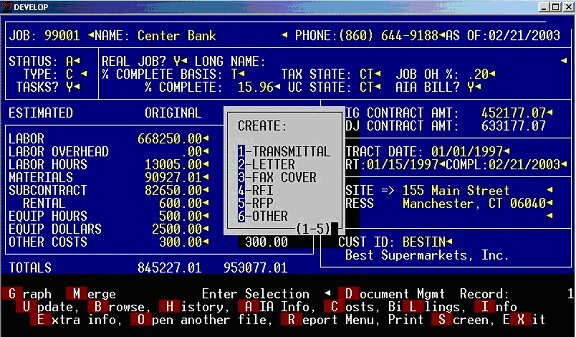 You can also catalog any external documents you like such as Excel Spreadsheets, other Word Documents, scanned documents, incoming faxes, pictures, email messages or anything else that has an executable viewer. This means that your electronic job folder can immediately bring you all the documents related to any subject at all. Information about each job document such as who it was to or from, what the subject was and other notes are stored with each document to aid in organization and retrieval. You can also store a Notify Date so you can find all late documents or even documents that have had no response at all. You get to set up the folders in which the documents will be stored. So you decide the organization you want to use. You can have separate folders for pictures, for example, or pictures can be stored in other folders such as Change Orders. Once you have decided on your folder organization, all new jobs cause new folders to be set up automatically for you. And your documents are stored automatically in an established folder so you can always find your documents. 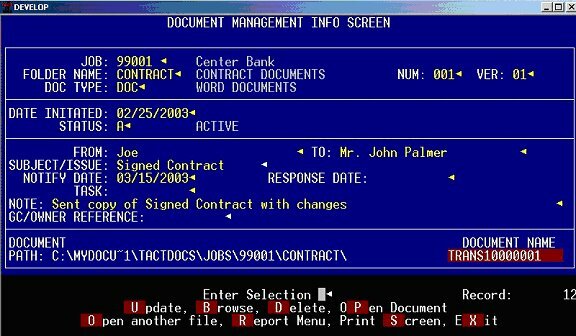 You can print a log of job documents for any subset of the documents in your system. 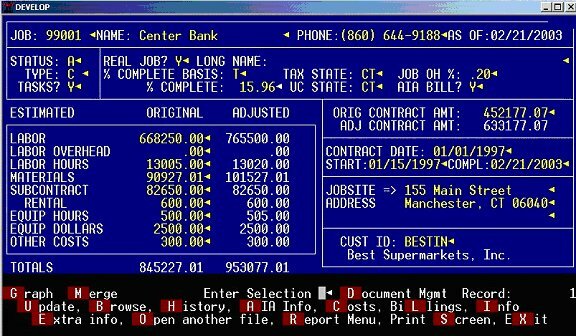 You can choose a range of jobs, tasks, who it was from, who it was to, what the subject was, something in the notes, a range of dates, customers, vendors, employees, equipment, status, folder, type, documents that are past due and documents that have not had a response. Document Management also allows you to review documents for employees, customers, vendors and equipment directly from TACT. TACT will show you all the documents that are stored for a certain type (such as pictures, Word Documents, spreadsheets, etc) for each employee, customer, vendor or piece of equipment. 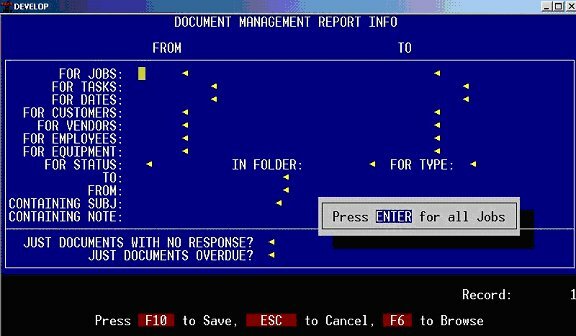 You then can simply choose that document and it opens immediately. This will allow you to store items such as the employee’s picture, a copy of their drivers license and social security card, copies of their Federal and State W4 forms, reviews, drug testing results ?anything that you currently keep in their physical employee folder can be stored with Document Management. 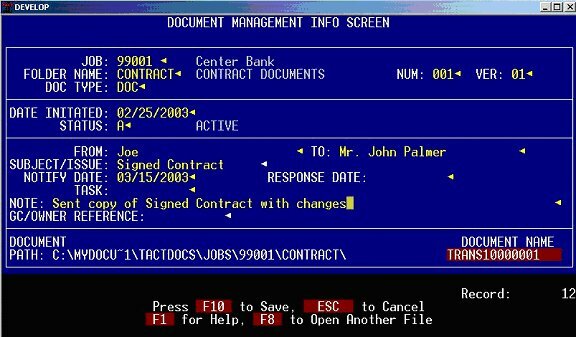 When on a job screen, you have two options that are part of Document Management ?M-Merge and D-Document Mgmt. When you choose M-Merge, you get the option of merging Customer or Vendor information. You then get the choice of the type of document you wish to create. You can set up any document you like to use the data merged from TACT. If you choose the OTHER option, you can enter the document template you wish to use for the merge so your choices are unlimited. Once you choose the type of document, you will be prompted with a list of folders so that you can choose the proper folder for storage of this document. The folder names are your choice. You can have as many or as few folders as you like. TACT will automatically set up the same folders for each job. 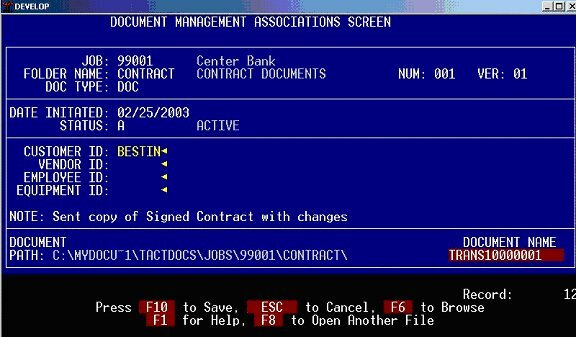 The next screen you will see is the Document Management entry screen. Here is where you enter data to help organize your documents. 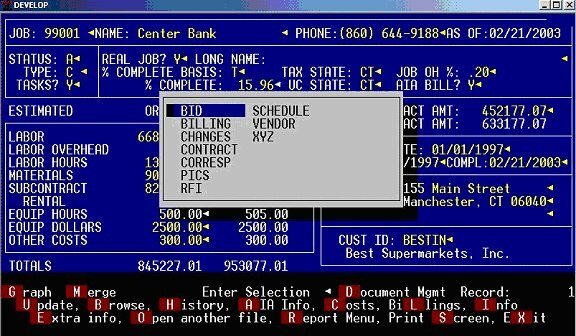 Note that the job and folder have been filled in automatically. You have lots of fields to fill in to help you retrieve this document in the future. If you have to resend a document or send it to multiple people, you can have multiple versions of each document. TACT automatically assigns a document name. The first part of the name indicates the type of document you are creating. The remainder of the document name is just a sequence number. 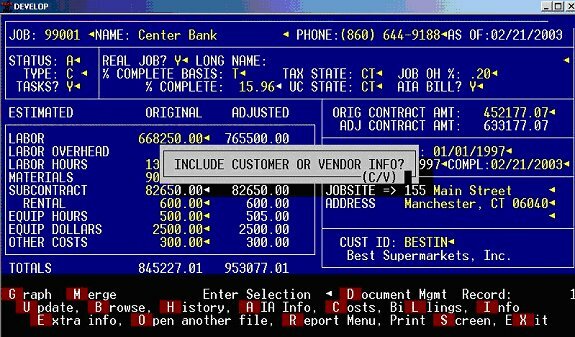 Since you will be retrieving documents using the information on this screen, the document name is insignificant. You will no longer be opening the document directly from Word or Explorer. The TO: field will be filled in automatically with the ATTENTION on the job. 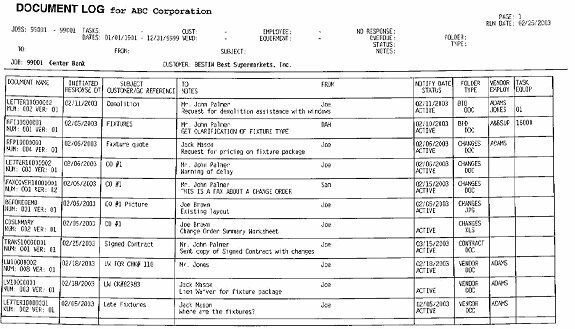 When creating Lien Waivers and AIA Change orders, the subject is also filled in automatically. 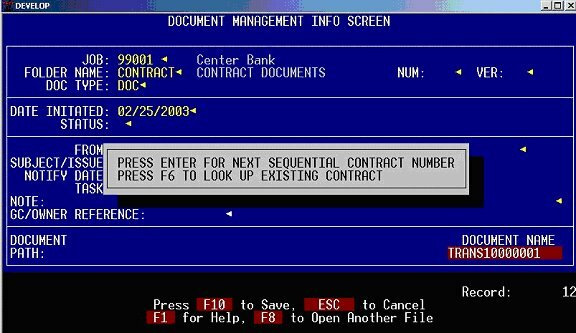 As you complete the fields on the screen, the path where the document will be stored is displayed. You tell TACT where you want your documents stored in the Company File. Job, Employee, Vendor, Customer and Equipment documents can all be stored in different places or all in the same place, if desired. When you complete and save this screen, a second screen appears for entering other information about the document. You can link any document to any Customer, Vendor, Employee or piece of Equipment so that you can search and report on documents related to any of those items. When you save the second screen, your document automatically opens. You then complete the document. Note that the document name is already on the document so all you have to do is save it when you close it. 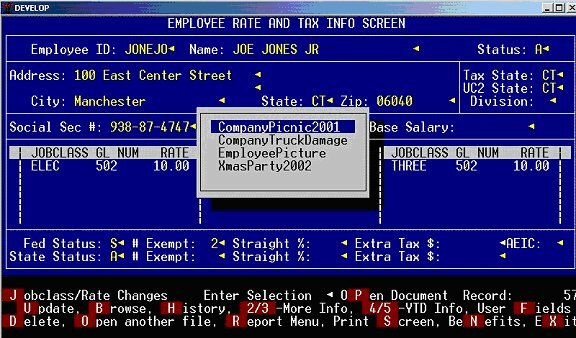 To retrieve documents, you will use the D-Document Mgmt selection on the Job screen. 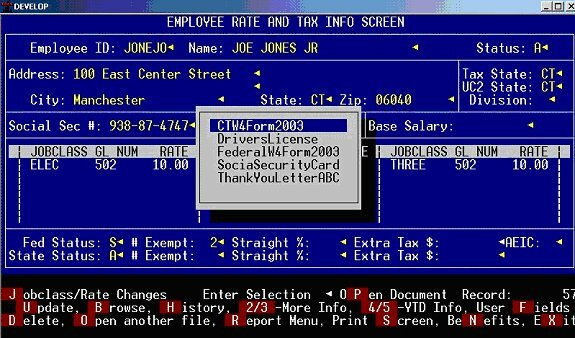 You then have many indexes that can be used to bring up the list of documents in many ways. The above browse is using an index that brings up the documents in order by job, then folder, then number, then version. There are two different browse formats set up but you can add as many different versions of this browse as you like. Once you choose a document, you have the option of P-Open Document. Pressing P will automatically open whatever document is on the screen. 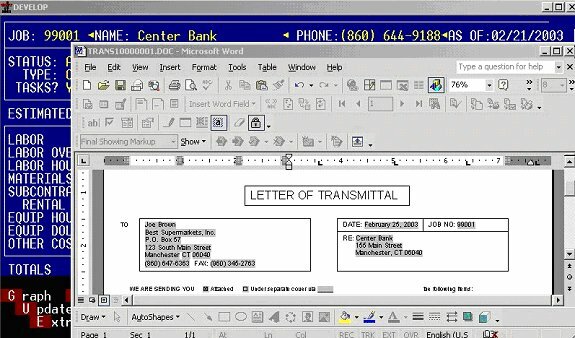 The document can be a Word document, a picture, an email message, an Excel Spreadsheet, a PDF file or any other format that can be opened with a viewer. 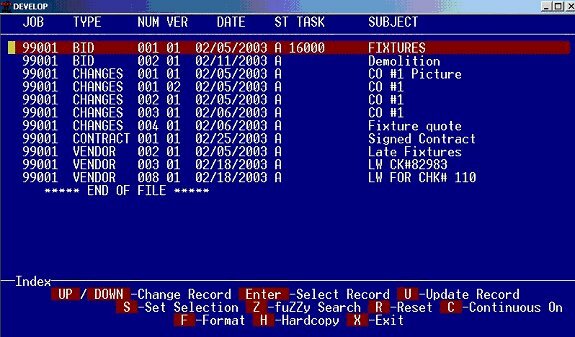 A Document Log can be printed for any selection of documents. There is also a free-form log if the selection criteria offered does not meet your needs. You can use any of the fields shown for selecting the documents you want. You then have several options for sorting the report. 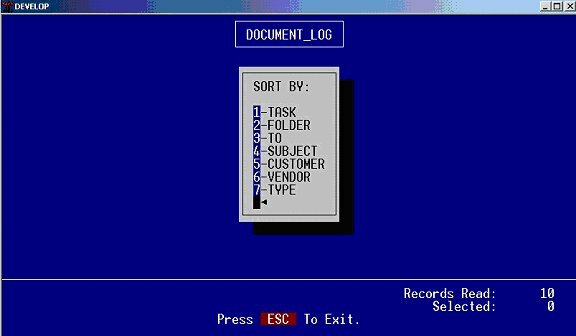 After choosing the sort, the result is a log of the documents chosen, showing the criteria used. 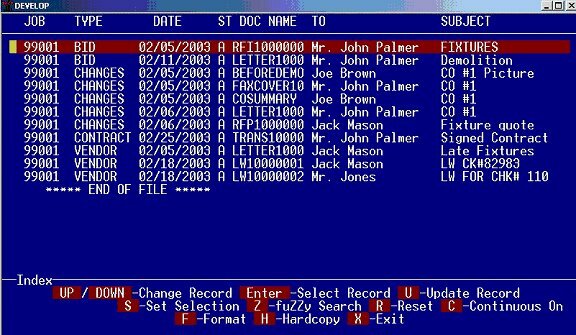 A Document Log could be printed at the end each job (each job automatically prints on a separate page) and then filed in the physical folder. The management of Employee, Vendor, Customer and Equipment documents is just a little different from Job Document Management. 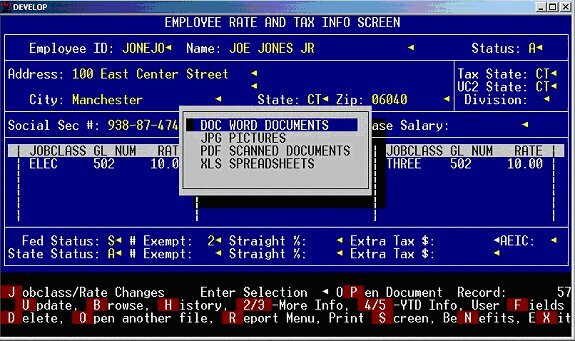 Separate folders are not used ?the documents for an Employee, for example, are stored in a folder named using the Employee ID. These types of documents are not created using TACT, they are simply retrieved. Once a document is stored in the Employee, Vendor, Customer or Equipment Folder, it can then be automatically opened in TACT. You will now have a new option P-Open Document on the Employee, Vendor, Customer and Equipment screens. When you choose P, you get a choice of the type of document you wish to open. This list is set up by you and can have other types as well. Once you choose the type of document, you will see of list of all those types of documents that are stored in the Employee folder. 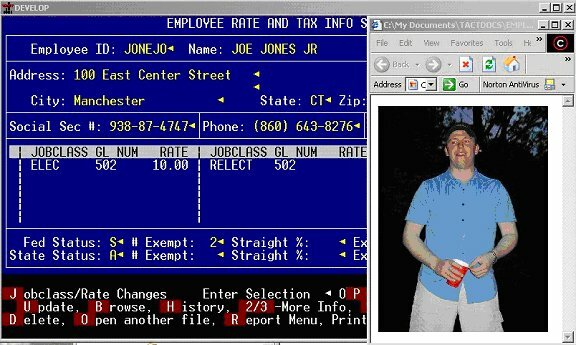 In this example, a list of Pictures is shown. When you choose one of the pictures, it automatically opens. 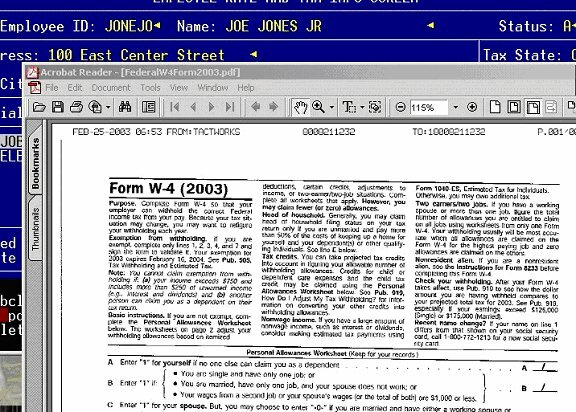 You can also store scanned documents such as W-4 forms, licenses, social security cards, etc. When you choose PDF documents, the list is shown of scanned or faxed documents that you have saved in PDF format. Choose one of the documents and it immediately opens. There is no limit to the number or types of documents you can store and retrieve for Employees, Vendors, Customers and Equipment. Document Management was designed to help you get organized. You will no longer have to worry about who has the job folder on their desk ?everyone does!